Why am I writing this. I have no idea. For some reason I had a post in my DRAFT folder named Chocolate Cigars. No post, just a title. I do not know why I thought to name something chocolate cigars. Why did I ever think that chocolate cigars was a good idea? Why did anyone ever think buying chocolate cigars was a good idea? When I was pregnant with my first I told my husband (neither of us ever smoked) that he should buy a box of pink or blue chocolate cigars after the baby was born so we could hand them out at the hospital. I had a girl. We had seen them in Hallmark one day and I thought it was a cute idea for the visitors. 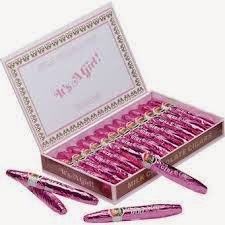 Baby arrives and we had our first daughter: He bought the pink foil wrapped chocolate cigars. The baby and I were in the hospital for 6 days; ample time for many people to visit. I remember handing out the cigars. We needed a second box. I don't think I ate more than one or two myself. I was breast feeding and to this day, daughter #1 is not a big chocolate fan. Three years later I was in the hospital having baby #2. Same direction to husband except this time I had him get two boxes at the start. Baby and I were in the hospital five days. I handed out one box but ate the entire contents of the other box in those five days. 24 chocolate cigars. I was breast feeding. Is it any wonder that my daughter is a chocolate lover and hot cocoa aficionado?